Under stated spacious and well equipped you will enjoy this Whistler townhouse rental offering two bedrooms one and half bath two level townhouse for your short or long Understated and well appointed. Bedding is Queen in Master, twins OR king in second and pull out sofabed. The master bedroom is located on the top floor overlooking the open living-dining and kitchen areas and offers flat screen TV. Vaulted ceilings highlighted with a cozy wood burning fireplace and deck! Free WIFI and flat screen HD TV in both living area and upper bedroom enhance your stay in time….Updated Bath Nov 2013. 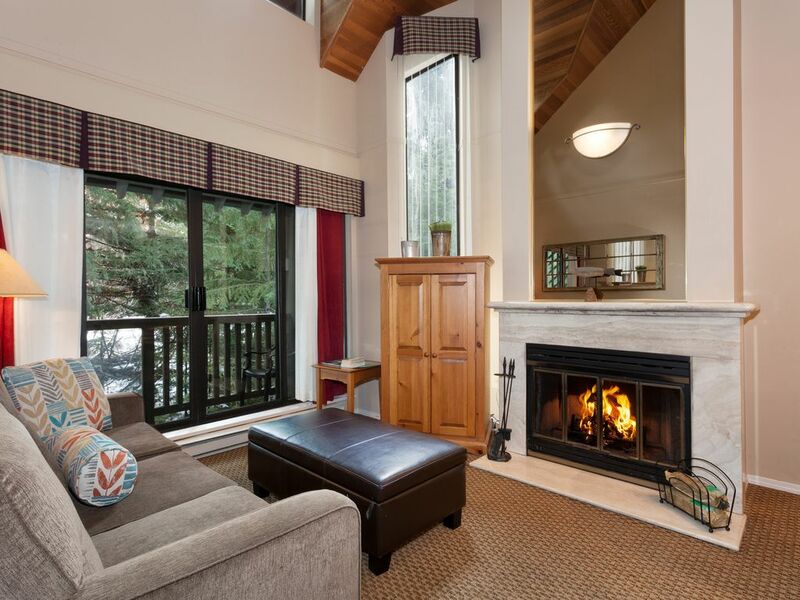 Ideally located within walking distance to all the activities Whistler has to offer. You will find Main lifts of Whistler Village out the front and to the right and with the Upper Village lifts just across the street. Take the back route along Fitzsimmons Creek only steps from the quaint covered bridge to parking lot 1 and the mid Village entrance which is 5 minutes at a slow pace! Fully furnished and comfortable 2 bedroom apartment. Good quality. Easy short walk to Blackcomb village, and short walk to Whistler sentrum. Recommended. So close to everything in Whistler Village and the perfect spot for people who want to be close but still have peace and quiet at night. Rental was very clean and check in process was very easy. Will definitely be staying here again when possible. Our stay at the Gables was very pleasant, it was peaceful, clean and close to the centre of town. Most important of all, it was close to the gondola and the chairs. The kitchen was well equipped and we were able to cook our meals everyday of our stay there. There was cable tv for us to watch our favourite programme in the evening. To sum up, I would rate it very high and would not mind returning for another stay at the Gables. Location unbeatable, walk to everything,the unit could use some updating,needs a place to put your clothes in 2nd bedroom/study, it is tight for more than four people. All rates applicable will be charged in CDN $$.